My fellow citizens — and non-citizens, for that matter — I come before you tonight to report that the state of atheism in this great land of ours is, if not exactly strong, improving. Not so many decades ago a reference to Jews in a presidential address to the assembled nation would have turned a head or two. It is now entirely unexceptional. Likewise, the followers of the Islamic faith merit faithful mention, even, mercifully, in contexts having nothing to do with terrorism or with conflicts in the Middle East. To tell the truth, the incantation, "Muslims, Christians and Jews", in any discussion of our country's religious traditions has become de rigueur. Leave any one of these out at your own political peril. It was, though, somewhat unexpected that Hindus appear to have made their way into the A-list, at least as far as presidential inaugural speech-making goes. Like Jews before them, Hindus have taken up a far more visible role in American academic, economic and cultural life than one would predict from their representation in the population alone. The fact that India is on its way to becoming a superpower sometime this century only enhances the standing of Indians - and, by implication, Hindus - in the American political mind. It's about time we started paying more attention to them. But, I have to admit, Barack Obama's nod to non-believers in his inaugural address took me completely by surprise. Having fended off assaults on his own Christian bona-fides from the Bible-thumping evangelical right for the better part of the last two years, I didn't expect that he was prepared so soon to poke this stick in their cage. Let's face it, in this country you can get away with acknowledging almost any god-fearing - or gods-fearing - religion in the name of ecuminism, but recognizing non-belief is still considered to be beyond the pale in many quarters. It took some guts. Thank you, Barack. Yet it's worth noting that our new president chose to restrict himself to using the generic term non-believers in his address. This is due in part to the fact that many agnostics, true non-believers, bridle at being called atheists. They feel that it mischaracterizes their open-minded theological stance. Fair enough. But Obama's choice of words also reminds us that there is indeed a stigma associated with the term atheism in political discourse here. As with homosexuality, once referred to obliquely as "the love that dares not speak its name", atheists are still identified by euphemisms such as non-believer. Sounds a bit like "the creed that dares not speak its name" to me. So, things are looking up. More and more varieties of belief - and non-belief - are being acknowledged in the public realm. But we haven't reached the promised land quite yet. 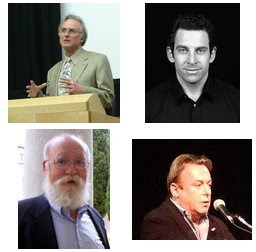 Before we do, atheism must be recognized as exactly that, without hesitation or excuse. Perhaps then all references to to religion in presidential addresses will be allowed to wither away. It is not for nothing that the Constitution opens with the undifferentiated, unqualified words, "We the people of the United States ...". Thank God you nailed that one . Great blog. Totally. Jon and I stared at each other with jaws dropped when Obama said Non-believers. Talk about generating true feelings of inclusion. A great speech and a great day.